TCG Gemlik departing. Official Turkish Navy photo. F-492 TCG Gemlik a Gabya class frigate, left her home port Aksaz, Marmaris today for a six month deployment in the Gulf of Aden. According to the official statement made by Turkish Navy, TCG Gemlik will stay in the region till December 2012 and participate in anti piracy efforts with the Combined Task Force-CTF-151. One S-70B Seahawk helicopter and two naval special forces teams are embarked on board. It is also stated that a Turkish Admiral will take the command of this multinational task force between September and December 2012. This will be third time that a Turkish Admiral commands the CTF-151. Previously, Turkish Navy did led the CTF-151 between 5 May -13 August 2009 and between 1 September -29 November 2010. I wish TCG Gemlik calm seas and following winds. The commander of two counter piracy task forces CTF-151 and TF-508 (NATO SNMG-2) met to discuss joint operations and coordination between these two task forces. Currently Turkish Navy has the command on the SNMG-2. More over Turkish Navy did led the CTF-151 twice 5 May -13 August 2009 and 1 September -29 November 2010. The meeting took place on board the Turkish frigate F-491 TCG Giresun on 20th January 2012. Today, with a ceremony on board of Royal Navy warship HMS Cornwall in UAE, Pakistan Navy Cdre. 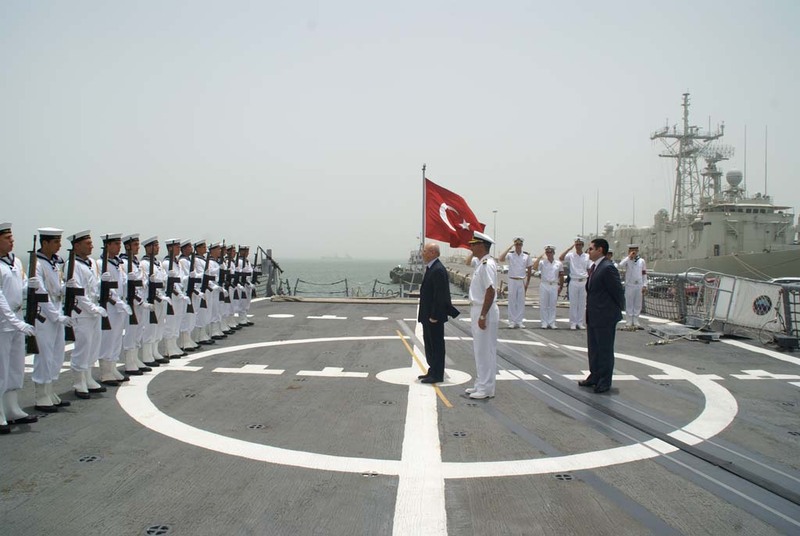 Abdul Aleem assumed the command of CTF-151, from Turkish Navy Rear Adm. Sinan Ertugrul. This is the first time that Pakistan will lead CTF-151. Pakistan regularly contributes warships to CTF-150 and assumed the command of that task force several times. “Given the importance of this region to international trade and the world economy, it could be argued that the problem of piracy has the potential to affect every individual on the planet,” said Rear Adm. Ertugrul, reflecting on his three months in command. Consequently, during my period of command it has been clear to me that international cooperation must underpin everything we do. Ertuğrul stressed the constant awareness joint Naval forces must have to continue to be successful in their counterpiracy mission. Currently, Australia, Republic of Korea, Pakistan, Singapore, Thailand, Turkey, the U.K. and U.S.
Turkey will transfer the command of CTF-151 to Pakistan on 29 November 2010. There will be a ceremony on board F-99 HMS Cornwall at Fujairah Port, UAE. UPDATE: I would appreciate any information about the Pakistani warship that will take part in CTF-151 and will serve as the flagship.